London, Ontario, is a city of 366, 151 residents, according to the 2011 Census count, and within a few hours' drive of Detroit and Toronto. The city has world-class ice-skating facilities and hosts international figure skating competitions and professional ice hockey games. London residents and visitors who want to skate at a rink or take lessons can choose from numerous facilities in the city dedicated to ice skating. London's city government manages 12 multipurpose indoor arenas in the city with ice skating rinks, but only seven offer public skating during the winter months. Arenas with public skating rinks include Glen Cairn, Kinsmen, Lambeth, Medway, Oakridge, Silverwoods and Stronach. Kinsmen and Stronach have two ice surfaces. Several arenas also have skate sharpening services, spectator seating, heated viewing areas and concession booths. Lambeth Arena also houses the neighborhood's public library. The city of London (london.ca) posts rink fees and season pass information for rinks on its website. Fans from around the globe travel to London to watch world-renowned figure skaters compete in events at the John Labatt Centre (johnlabattcentre.com), the site of the 2013 International Skating Union World Figure Skating Championships (worlds2013.ca). Both the Labatt Centre and the Western Fair Sports Centre (westernfairdistrict.com) host hockey league games. If you would like to learn how to skate or want to sign your kids up for lessons, the city's rinks provide lessons for all ages. The Tot-skate program is for preschoolers. It combines creative activities with skating instruction to teach youngsters how to navigate the ice without an adult. The program limits class size for toddlers to 15. The youth program for kids over 4 teaches basic skating fundamentals and techniques. 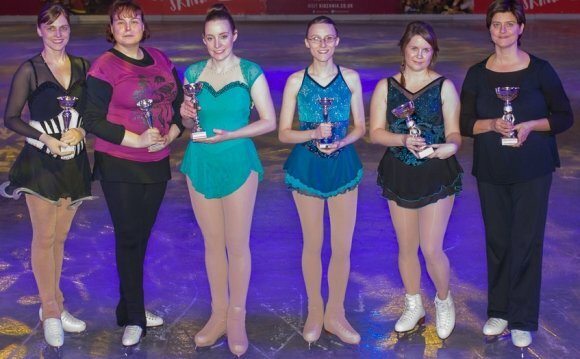 Adult classes allows skaters advance at their own pace. The city offers online registration for lessons. During the winter months skaters can also visit outdoor arenas. The city's 15-acre Victoria Park has an outdoor rink among the 19th century landscaping and public art. Skating at Victoria Park is free. Located in central London, Covent Garden Market's (coventmarket.com) rink is open for free skating until early evening during the winter and until late afternoon on Sundays. The indoor and outdoor market also hosts arts and entertainment events. Storybook Gardens (storybook.london.ca) is a city-run amusement park with a 250-meter skating trail that winds through the parks scenic areas that depict nursery rhymes and children's stories. A viewing area for the park's farm animal area is also on the trail. Storybook Gardens offers rentals and charges a fee for skating. Users of city-run indoor and outdoor rinks must abide by several rules in order to skate. All children under 5 must wear Canadian Standards Association-approved helmets. Skaters cannot bring food, chairs or umbrella stroller onto rinks. Only beginners can skate in the rink’s center circle. Skaters cannot play games, including hockey, during public skate sessions. The rules also prohibit skating backwards, snowball fights, holding children in your arms while skating, figure skating routines or maneuvers, and people not wearing skates.